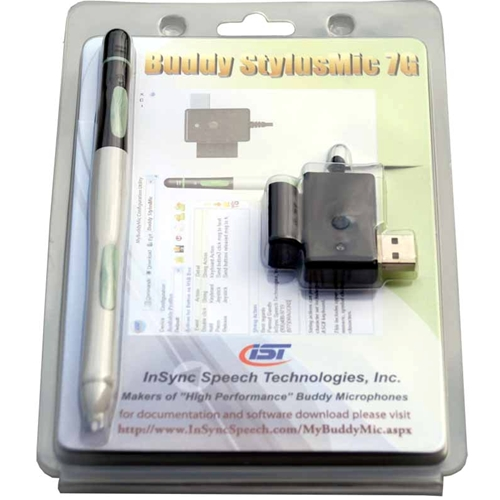 Buddy StylusMic 7G is a highly customizable, multi-function USB stylus and microphone. It’s designed as an all-in-one productivity aid for Tablet PC and Notebook users and is ergonomic, sturdy, and stylish. Buddy StylusMic 7G includes a noise-cancelling microphone element for pure audio. Performance is equal to standard headsets. The Push-to-Talk button means the microphone only listens when you want it to, yielding high recognition accuracy with Dragon NaturallySpeaking and Microsoft Windows Speech Recognition. Buddy StylusMic 7G includes three programmable push buttons and two RGB lights for visual feedback. Common functions, such as moving from field to field, come pre-programmed. Button functions are re-assignable using our free MyBuddyMic software. The software interface is clear and user-friendly, allowing you to change functionality such as Push-To-Talk, Mute, or direct control in Dragon NaturallySpeaking. Each button can generate three distinct events (Click, Double-Click, or Hold) for a total of nine unique button events. Button actions also simulate the use of keyboard, mouse, or joystick, so you can even create re-usable text (e.g. for a sign-off). MyBuddyMic allows you to save button assignments for multiple profiles. Use one profile for your work computer and another at home. Three pre-programmed profiles are included with MyBuddyMic to support three microphone control modes. Choose which you like, or modify for your own personal preference. The microphone unit can store up to 500 separate actions or data strings. MyBuddyMic software is required to customize advanced operations, but the majority of basic operations need neither programming nor driver software on the target computer. Advanced operations include maintaining a list of voice commands for a speech engine such as Dragon NaturallySpeaking.